In a post-this and post-that age of heavy metal where purebred genres have run their courses, many musicians have turned to the great metal mixing pot to stir up the next genre niche. Which generally makes for an amazingly interesting and healthily diverse environment in the world of extreme music but a glaring issue that consistently pops up these days is one of ‘grab bag metal’: when bands throw seemingly random influences and flavors together into an incongruent stew of seemingly disparate styles. Sometimes it works oddly well (Diablo Swing Orchestra) and at other times it simply falls on its face (most bands who paste flute-synths over generic thrash and call it ‘folkmetal’). Thankfully Toronto’s Sludgehammer fall into the category of the former with their energetic and fist-pumping melding of thrash, death, groove, and even some power metal. With two vocalists trading off with different yet complimentary styles and a group of technically impressive musicians, this band has concocted a genuinely fun headbanger of a debut LP in ‘The Fallen Sun’, which drops June 10 as an independent release. The guys in the band spared a few moments to talk about the new album and their evolution since their demo and subsequent EP. 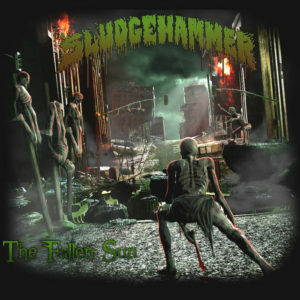 How would you describe Sludgehammer’s sound in your own words? It’s hard to lump into a category as there’s elements of different metal genres in there. We pretty much just call it Death/Thrash/Groove. Everybody has different metal influences and I think that shows up in the songs. You’re from the Toronto area, which is a big hub for music in Canada. How’s the metal scene up there? Its great, there’s a lot of different metal bands up here. Lots of shows to go to and lots of people to get to know. Hopefully some of these bands get the exposure they deserve and people around the world take notice. What are some other bands you share the stage with that you’d like everyone to know about? Black Absinthe is great. Vesperia just won the Wacken metal battle. Caym and Viledriver kill it on stage. Lots of great potential everywhere. Mutank are our friends from Montreal. Your music had a much more focused and tighter feel after the original demo on the ‘Organ Harvester’ EP, and now the new album seems to have an even bigger sound and songwriting dynamic going on. How has the writing process evolved for you guys? Well we made a conscious decision after ‘Organ Harvester’ to make the songs a bit for technically challenging. Not that we didn’t like ‘Organ Harvester’ we just thought we could step it up. So we said at a band meeting to get ready to work hard on the next album. Everyone knew that we weren’t messing around and everybody did work hard. The new album has a two-vocalist dynamic that originally wasn’t part of the band’s early sound, like on the demo. How did that approach evolve between then and now? Our bassist/vocalist Dan was the last person to join the band. So because of that we had songs with Chris already written for the Demo and Dan wasn’t able to put extra vocals on any of those songs at the time. When we started writing for ‘Organ Harvester’ we incorporated Dan’s vocals immediately. We all thought it was a great direction to go in. How has adding a second guitarist to the line-up changed the sound of the band? Do you approach the older songs differently now with the greater range available? Yes, actually we re recorded the song ‘Organ Harvester’ for ‘The Fallen Sun’ because Tyler added some new elements to the song. He did that for a couple of the older songs, so now for live performances they sound even thicker. Adding a second guitarist has just completed the puzzle basically. We’re complete now. 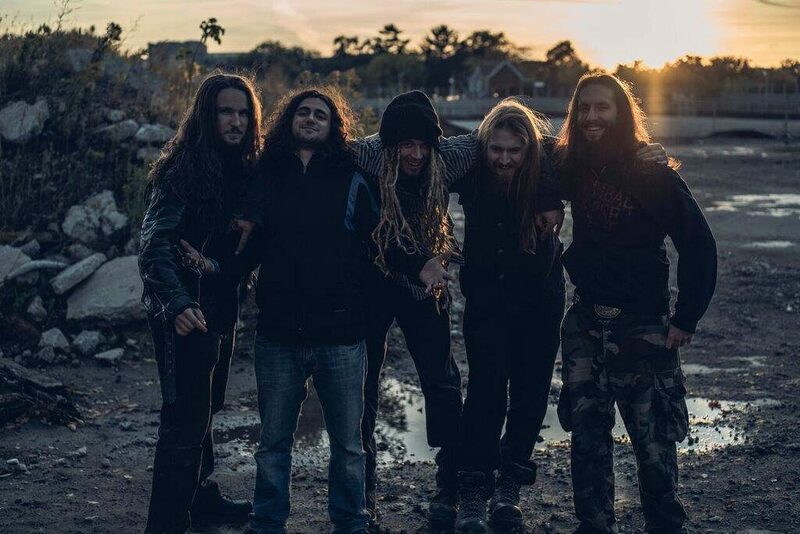 ‘The Fallen Sun’ is the band’s first full-length album, how did the process of getting into a studio and recording it go? Well another added bonus about adding Tyler was he has his own studio, Monolithic Productions. The process was unlike anything we’ve ever done before as it was a lot of songs and everybody works day jobs. So it took us a couple months to get it recorded. We did the drums in January and the Vocals in April so that gives you an idea of the timeline we were involved in. With a second guitarist added, many shows played, an EP, and now a full-length under your belts, does Sludgehammer feel like a fully realized and solidified band? Ya we feel like a fully solidified band but we are nowhere near where we want to be career wise. We are getting a great response which makes us feel like we are on the right track but we still have lots of work to do. With the new album released, what lies ahead for the band? Lots of shows and more and more records. We are not stopping until we get some exposure and we thank everyone who has helped us thus far. ‘The Fallen Sun’ is available this Friday (10th), so make sure to get your copy!